Washington Potato Commission Leader Goes On All-Potato Diet The executive director of the Washington Potato Commission is on an unusual campaign to protest a decision by the U.S. Department of Agriculture. Chris Voigt is on a diet that even he admits is a little crazy. 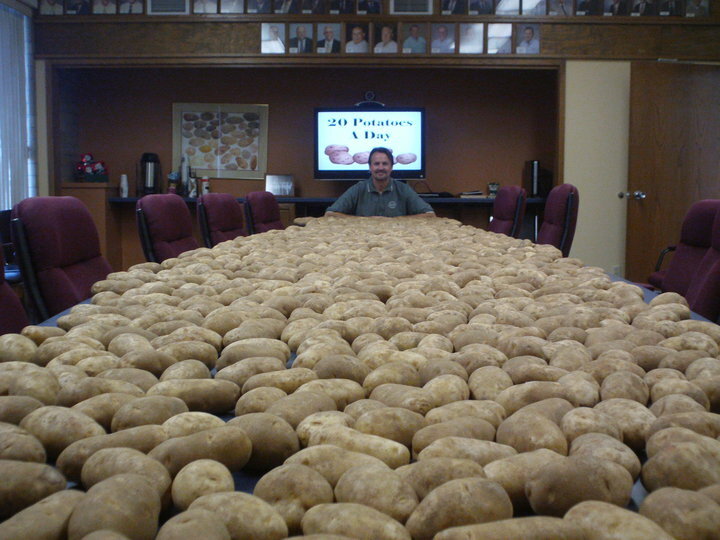 He’s eating 20 potatoes a day for 60 days. Correspondent Anna King explains why. The executive director of the Washington Potato Commission is on an unusual campaign to protest a decision by the U.S. Department of Agriculture. Chris Voigt is on a diet that even he admits is a little crazy. He’s eating 20 potatoes a day for 60 days. Correspondent Anna King explains why. Chris Voigt is eating nothing but potatoes to get the U.S. Department of Agriculture’s attention and the public's too. Voigt says recently the USDA excluded potatoes from its list of subsidized foods in low-income programs. And now the agency is deciding whether potatoes should be allowed in school lunches. Voigt's efforts have garnered the attention of Washington Governor Chris Gregoire who posted a video to his Facebook page. But Voigt says it’s harder than he thought to eat the roughly 7 pounds of spuds a day with nothing but a little oil, herbs or chicken bouillon. Because of his diet Voigt won’t get any turkey on Thanksgiving. His protest ends on November 30. He hasn’t decided what his first meal after the all potato diet will be.